A total of 252 traffic accidents were reported in Dubai in three hours and at least 58 trees were uprooted due to heavy winds and rain on Friday, according to Col Turki bin Abdul Aziz, director of command and control section of the Dubai Police. Two women were injured after a tree fell over her residence in Al Khawaneej area. In another incident, the roof of car parking was flown off by the strong winds, but no injuries were reported, he added. Most of the traffic accidents were collisions due to poor visibility and slippery roads. Col Said Muhair Al Mazroui, director of the traffic department, said a car crashed into concrete barrier, but the passengers escaped without injuries. Also in Dubai, rain and windy conditions were experienced in Rashidiya, Mirdif, International City and Dubai Sports City while Deira and Al Ghusais experienced also had moderate rainshower. 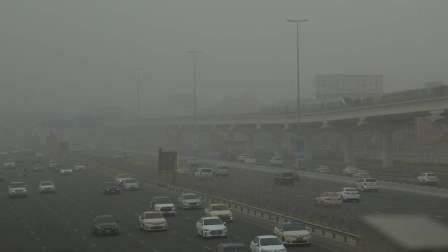 Other parts of Dubai that did not experience rain were affected by blowing dust that caused poor visibility to less than 2000 meters in some areas. The Roads and Transport Authority called upon the motorists "to be cautious while driving in several areas of Dubai due to the strong winds and rain. Police patrols were deployed across Dubai roads to clear the traffic after accidents.